From the Hawks Schoolhouse, I headed back over to the small but amusingly named town of Nimrod. 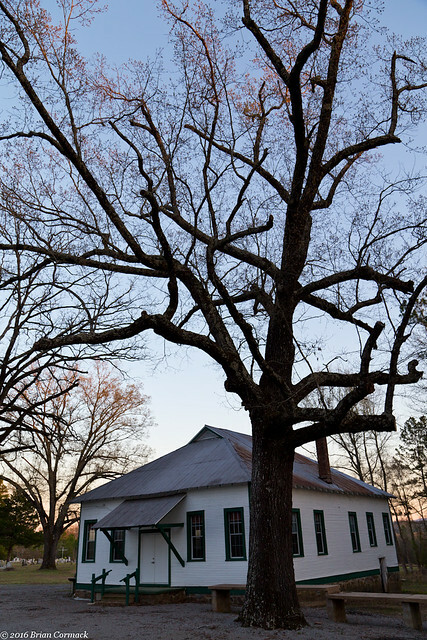 On the edge of town, tucked under some tall trees, is an old church (or school?). I haven't been able to find anything online about its history or when it was built. I'm assuming that its a church because it sits right next to a cemetery. The old building has recently been painted and cleaned up, and it looks really good. I can't imagine how difficult it must have been to get rid of the old paint that had been peeling and chipping off. It's nice and reassuring to see that people are maintaining and preserving historic old buildings like this. I had wanted to get a star trail picture here, but it was not an ideal night for star viewing. There was a full moon, which was so bright that it obscured many of the stars. But I went ahead and tried, mostly because I didn't want to wait much longer. The old building is flanked by two large trees, and I wanted to get a shot before the trees got their new leaves. Plus I wasn't sure when I'd be able to drive back out there, so I set up the camera even if things weren't perfect. The camera was set to continuously take 30 second exposures, which is enough to capture some movement in the stars (after two hours, it took about 220 shots). But when I got home, I looked through the shots and saw that some smoke from a nearby fire had sneakily made its way into many of the pictures. The smoke messed up about half of the shots, so this is the star trails made from the pictures that were taken before the smoke appeared. 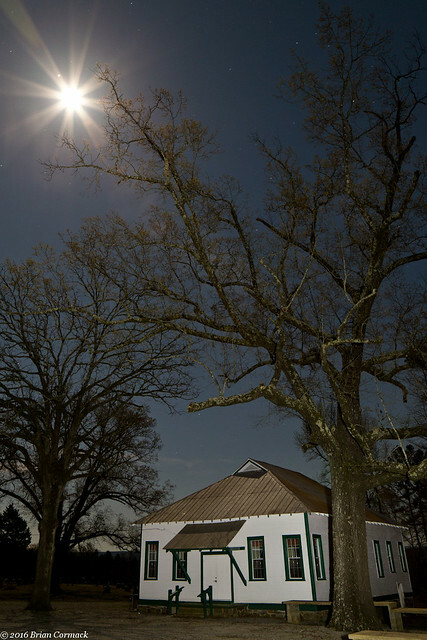 I took one last picture of the full moon shining high above the old building, and then packed up the car and made the drive back to Little Rock. I took another break from the babycare duties and went out to take a few pictures. 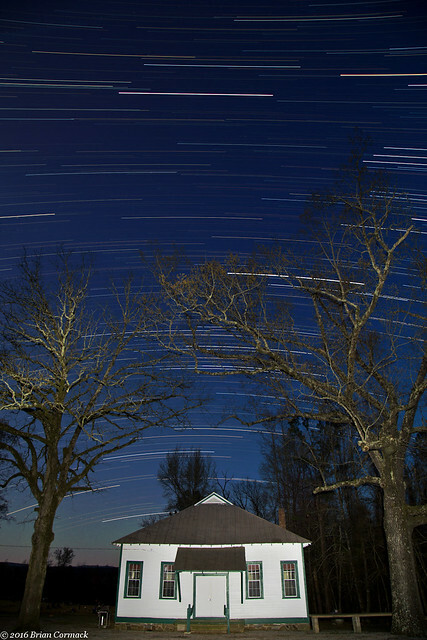 I headed out west into the Ouachita Mountains, with the hopes of getting some star trail pictures that evening. Since I had to wait until it got dark, I had some time to kill and decided to drive over to an old schoolhouse that I recently saw photos of posted online. It was only about 30 minutes away, so I headed over before sunset. 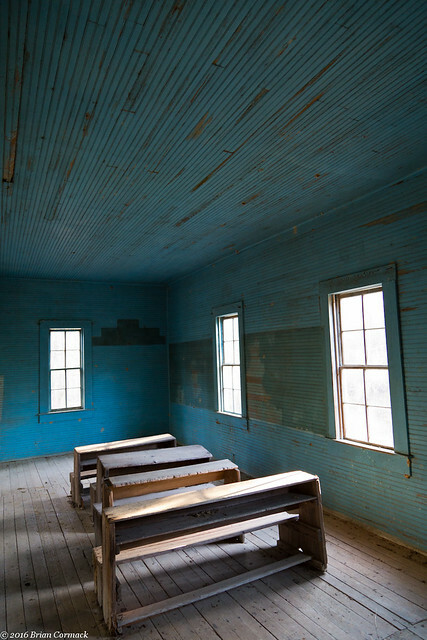 The school is the old Hawks Schoolhouse, in Perry County. The school is named after the Hawk family, who donated the land for the school to be built (unfortunately it was never used to educate hawks). The school was built in 1911 and operated until 1949. 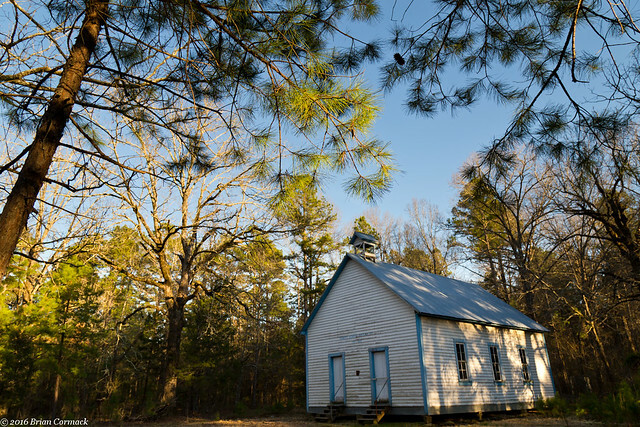 Besides being a school, the building was also used for things like summer picnics and church services. It's been nearly 70 years since the building served as a school, and it is in remarkably good shape. The door was unlocked and there are a few school desks inside. 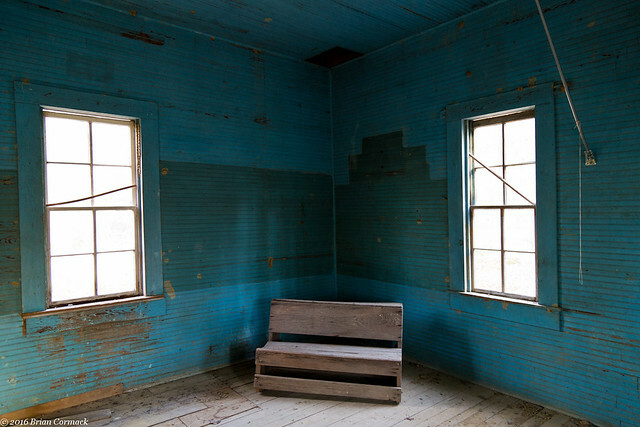 There are many old buildings that are falling apart, due to the neglect and decay. So it is nice and refreshing to see a building like this that is obviously maintained and looked after. We had some heavy rains recently, which meant some good conditions for getting out to see some waterfalls. Since I'm off work, I actually had time to get out. But since that time off is supposed to be spent caring for a newborn baby, I only had a few hours to spare. 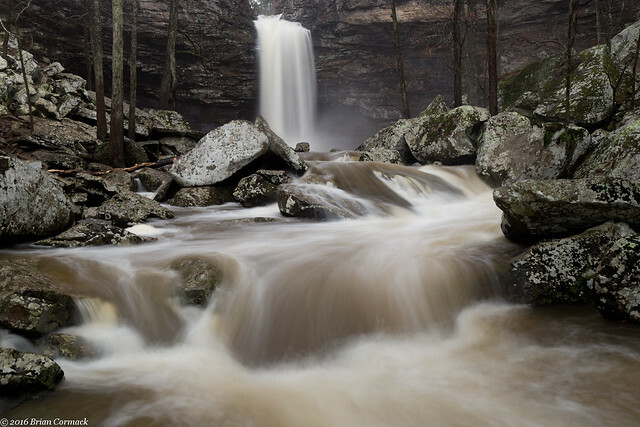 So I decided to go out to Petit Jean Mountain, which is fairly close by and is a dependable location for waterfall viewing. I left in the afternoon, and headed to the park. 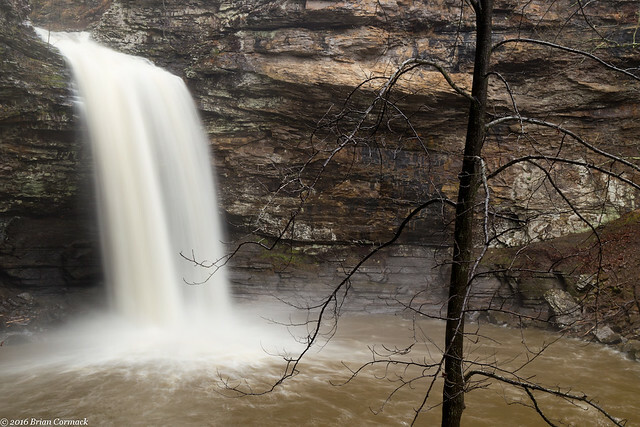 I decided to do the hike to Cedar Falls, which at 95 feet is one of the crown jewels of Arkansas waterfalls. Cedar Creek, which runs across the mountain and forms Cedar Falls, was running a little high after the rains (but definitely not as high as the last time I was there). It was raining when I started the hike, and I had to awkwardly cover the camera with an umbrella when I tried to get pictures. This was taken along the beginning of the hike, when the trail runs downhill next to a small stream. 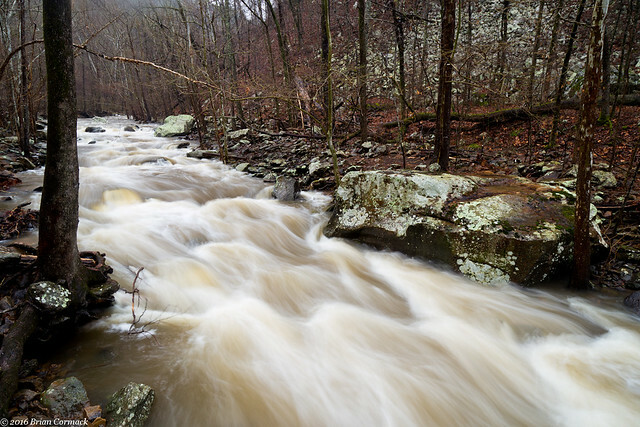 The trail then soon follows along Cedar Creek, which rushes past large rocks and boulders. The trail ends at Cedar Falls. 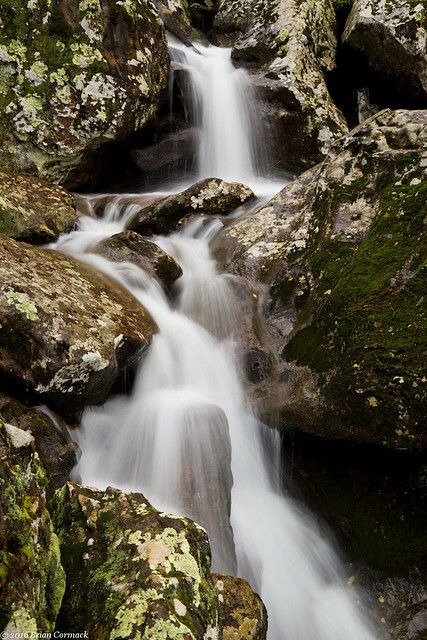 The waterfall is 95 feet, and while it isn't the tallest waterfall in the state it is probably the most powerful. The roar of the falls echoes off the canyon walls, as mist drifts down and soaks everything along the creek. This was a good place to set up for pictures since the overhanging canyon walls provided a dry spot from the rain. 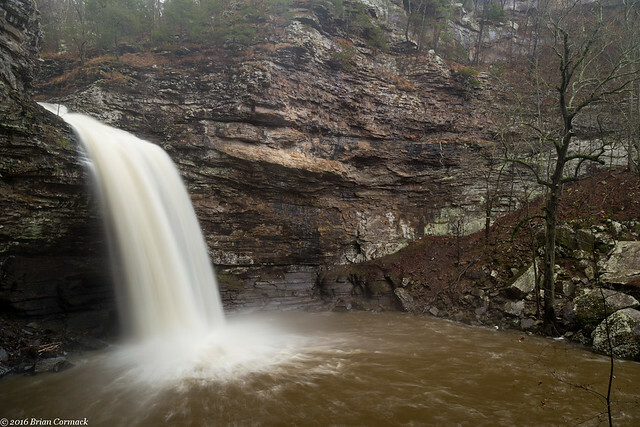 Here is a panoramic shot of the falls, this is actually three photos stitched together. It does a better job of showing how large the pool is at the base of the falls and the tall canyon walls. It was starting to get dark so I needed to start heading back, but I stopped for one last shot of the falls. I was standing on a rock in the creek to get this, with water from the creek rushing across and splashing over my hiking shoes. Since my work has such a generous paternal leave policy, I've been at home since the baby was born. While I didn't miss having to change diapers, I did miss the time away from the little guy so I was happy to start driving home to see him again. 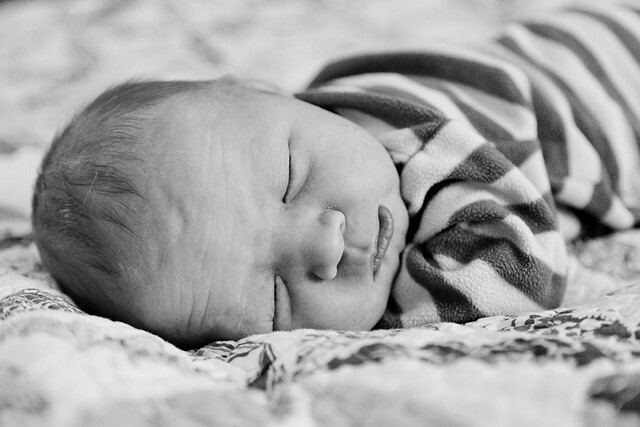 Here is a quick picture from a recent photo shoot we did with him in honor of his being one month old. My work recently implemented a very kind and generous parental leave policy, which was great timing since it went into effect right before we had our baby. But I am currently in the middle of 12 weeks of fully paid leave, and won't have to return to work until May. It's been great to have this extra time to help care for the baby, and to spend time with him. It's also probably beneficial to my work since I'd probably be falling asleep at my desk if I was in the office. As a first-time parent, it's been nice to have the time off to spend with the baby (even including the times when we've found out what the term "blow-out" means). 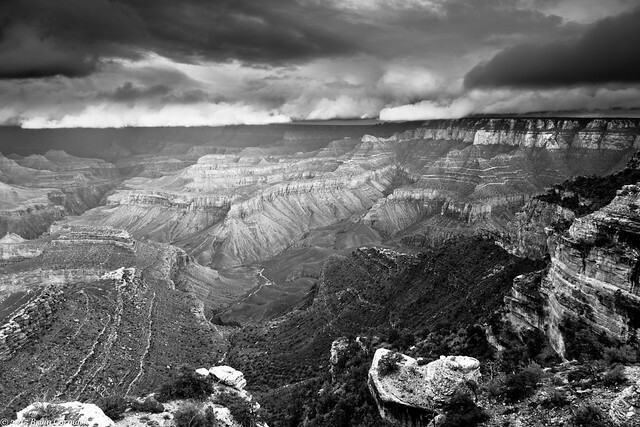 It's also given me some time to re-work some of the pictures from our road trip last fall to Arizona. I converted a few of them to black and white, and was actually pleased with the results. I haven't been able to take very many new pictures in the month or so since the baby was born (besides pictures of the baby), but I'll share a few of these if anyone doesn't mind. 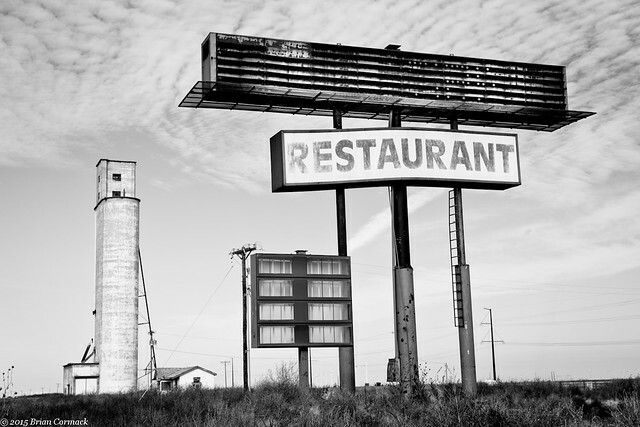 The first ones were taken along Route 66, in the Texas panhandle. 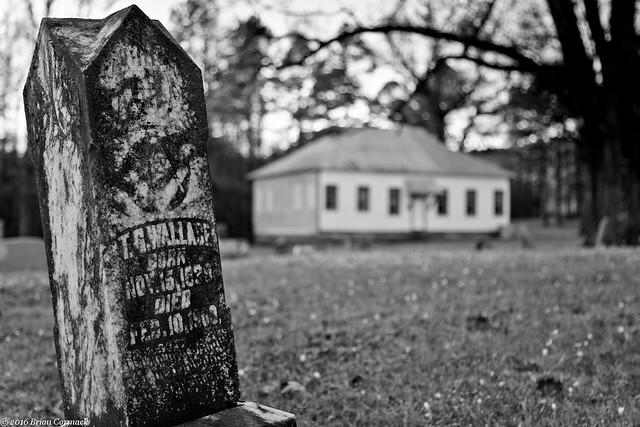 This was in the small community of Landergin, which is actually referred to as a ghost town. There were only a few buildings here, and it looked like all of them were abandoned. The next shot is from the Petrified Forest National Park in Arizona, with a view of the large rock formations known as "The Teepees." 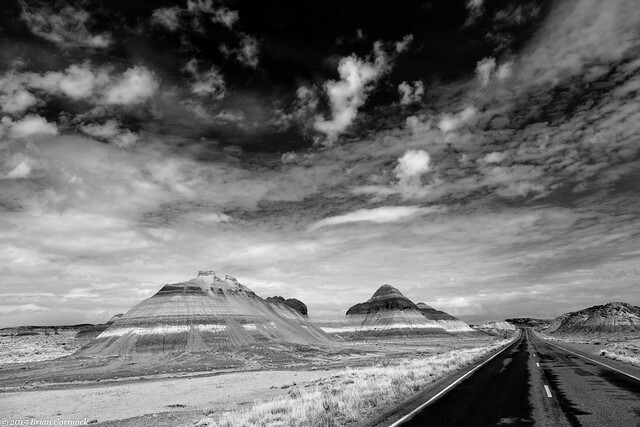 The Petrified Forest is a vastly underrated national park. For a park that isn't very big, it has so many varied landscapes. 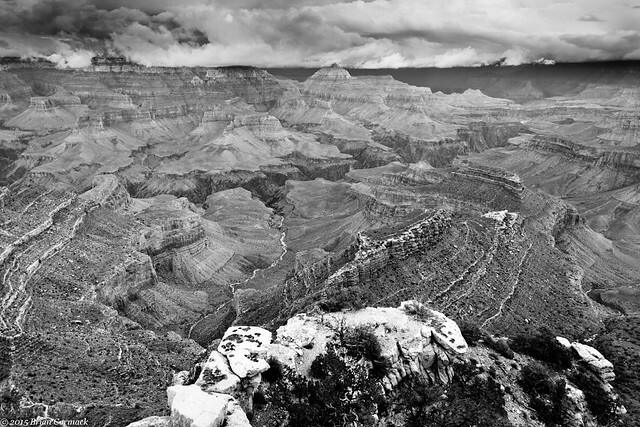 The next shot is from the Grand Canyon National Park. After we left the Petrified Forest, we drove across Arizona and got to the Grand Canyon right before sunset. We rushed to get to an overlook, but it was cloudy and there wasn't much of a sunset. 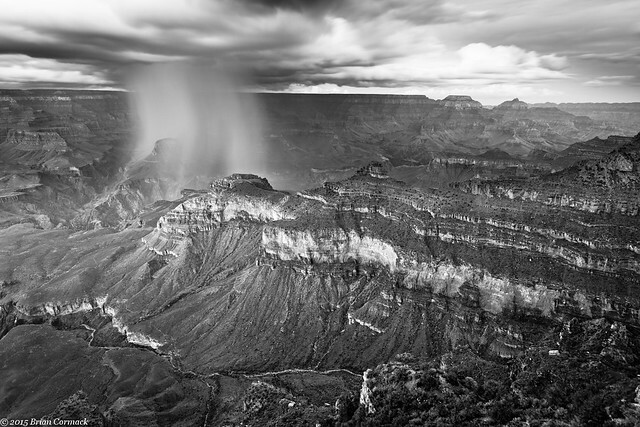 A small rainstorm popped up, and slowly drifted across the Canyon. This was taken when it was nearly dark, and was a 20 second exposure. We spent a few days at the Grand Canyon, and were lucky to see lots of different weather conditions there (everything from sunny days to lightning storms). 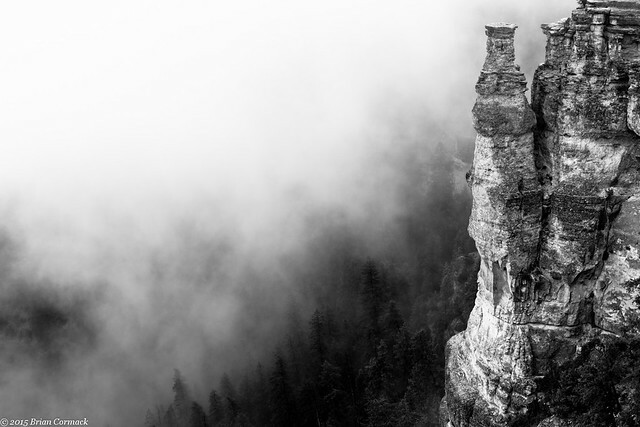 One morning we drove in and the Canyon was shrouded in a thick fog. These next shots were taken from Shoshone Point at sunset. There wasn't much of a sunset here, since it was storming off in the distance. The setting sun did briefly illuminate the canyon and the low clouds hugging the North Rim. Our next stop was the city of Page, Arizona. Page has turned into a bit of a photographer's Mecca. 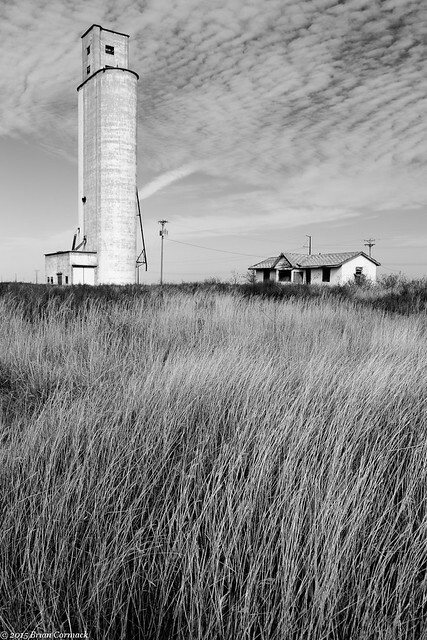 Located just a few miles outside of the city are two incredibly popular photo destinations. 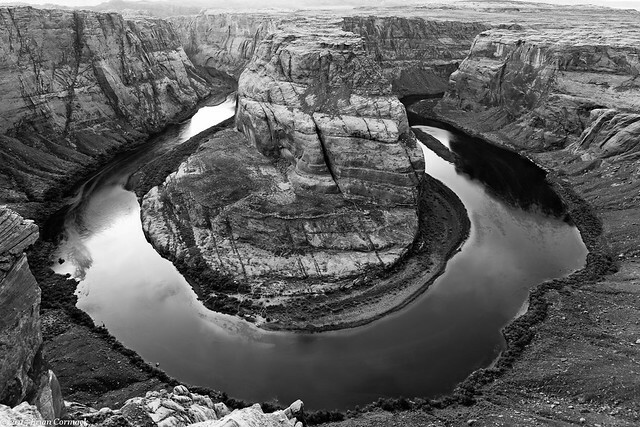 The first is Horseshoe Bend, the famous tight bend along the Colorado River. I've seen thousands of pictures of this view, but was not prepared for how steep the overlook is. It's 1000 feet to the river below, and there is no guard rail. 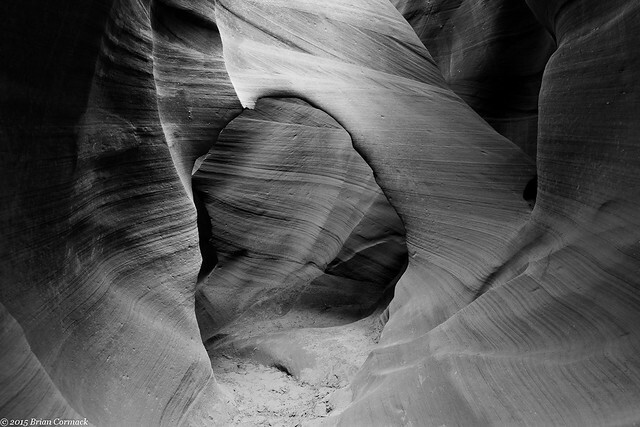 The other popular place is Antelope Canyon, which sits on Navajo land just outside of Page. I did a photographer's tour of Lower Antelope Canyon, which meant I got to spend two hours in the canyon and was allowed to bring a tripod (it also cost a bit more). There were only two other people on the tour, but it was still difficult to try to shoot pictures in the narrow canyon and avoid the other photographers. I only got to take one picture of this view before one of the other photographers strolled over and plunked her tripod down right under the carved stone arch. As I'm writing this right now, I'm listening to the baby sleep through the baby monitor. 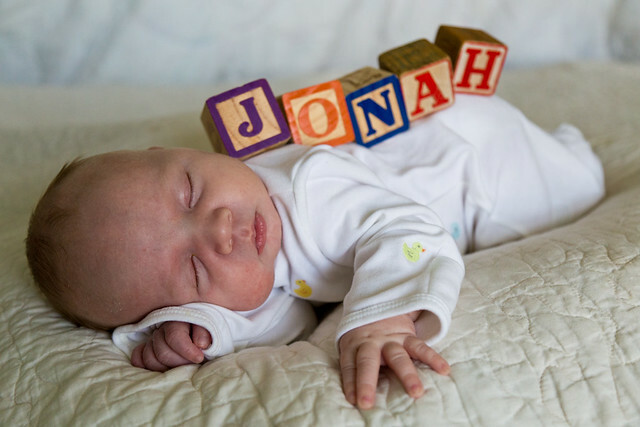 So to keep the black and white theme going, here's a quick picture of Jonah. I haven't had much practice with infant portrait photography in the past, but I expect that's going to change in the near future.